Fed Exit a Blue Pill? While we are busy arguing whether the Fed’s exit will consist of rising rates, reverse repos or the trimming of its massive portfolio, the Fed may well be fooling all of us. Investors must have been swallowing lots of blue pills not to see the illusion hiding in plain sight. Let’s assume that we will indeed get a rate hike next year, and that the Fed will have figured out how to implement it. We may get our exit all right, but it’s not the sort of exit most appear to be expecting. That’s because in our humble view, an “exit” ought to reflect a path towards normalization, away from financial repression, back to an environment where pensioners might once again be able to live off income generated from their savings. 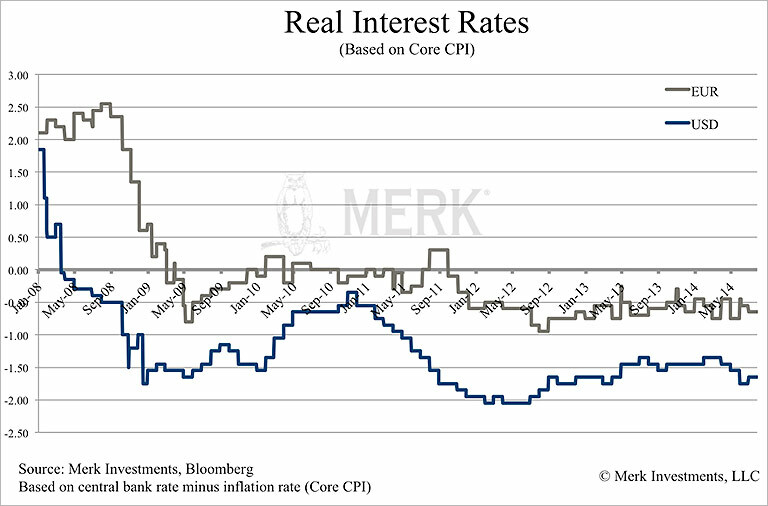 If anyone dares to take a red pill, you will learn that interest rates net of inflation, i.e. real interest rates, have not only continued to be negative, but become more negative of late, meaning inflation has started to inch upward. For normalization to occur, interest rates must move higher faster than the pace of inflation; and not only do real interest rates need to move higher, they ought to move into positive territory to suggest we might be exiting financial repression. 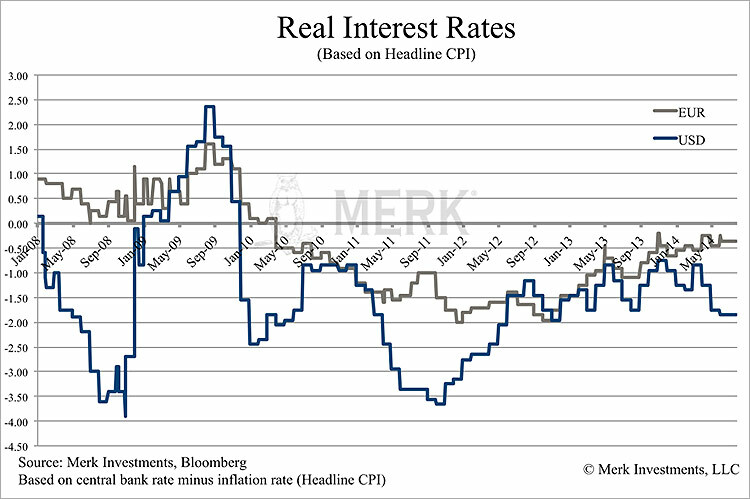 The chart above shows real interest rates in the U.S. versus the Eurozone. While pundits focus on the fact that the European Central Bank (ECB) now has a negative rate on deposits, most forget the inconvenient truth that real interest rates are higher in the Eurozone than the U.S. Not only are rates higher in the Eurozone, but the gap has also been widening. Yet, investors appear to be embracing the storyline that rates will be lower for longer in the Eurozone, as we have the Fed about to raise rates. Critics of the Fed suggest that U.S. inflation is higher than reported, further increasing the threshold to get us away from financial repression. In the meantime, ECB head Draghi is trying to convince investors that rates in the Eurozone will stay lower for longer; Draghi has even said that real interest rates are negative and are likely to become more negative over time. The relevance to this discussion is simply that there’s a central banker being frank. And the reason he is so frank may well be that it is far more difficult to induce inflation in the Eurozone than in the U.S. In the U.S., we see inflationary pressures come up in pockets. Full-time employees, for example, appear to have pricing power, even as the Fed’s preferred gauge of all employees remains fairly stable. In our assessment, we have a bifurcated recovery where those with assets, those with jobs, do well, but the have-nots are left behind. And because Fed Chair Yellen cares about Main Street, she wants to keep rates low until the have-nots have recovered from the Great Recession. Are economically disadvantaged Americans really so different from Portuguese workers? At the risk of grossly oversimplifying the respective challenges, keeping rates low to help out those left behind might allow inflation to creep up elsewhere. Conversely, consider the prosperous end of the spectrum? Clearly there are differences between wealthy Americans and the German economy, but inflation has been creeping up in their respective domains. What is different between the Eurozone and the U.S. is that the U.S. economy is far more sensitive to the markets, whereas the Eurozone economy is dependent on the health of banks. And given the ongoing balance sheet challenges faced by Eurozone banks, I don’t think one needs to be a rocket scientist to determine that inflationary pressures more easily build in the U.S. In the U.S., much of the economic recovery is based on asset price inflation: when homeowners are no longer ‘upside down’ in their mortgage, they might be better consumers. As asset prices have floated higher the wealth effect might get consumers to spend more. Aside from the problem that lots of folks have been left behind in this so-called recovery, it may be at least as much of a challenge that such a recovery is rather unstable, as the “progress” may be lost if asset prices come back down. Positive real interest rates could create immense headwinds. As we discussed in more depth in our recent Merk Insight ‘Instability the New Normal?’, one of the Fed’s biggest achievements is to compress risk premia, to make risky assets appear less risky (as evidenced, for example, by low volatility in the stock market or low yields available in the junk bond market). If the Fed indeed were to pursue an ‘exit,’ odds are that risk premia would go back up – a more fearful environment may cause substantial headwinds to the economy (as well as asset prices). Again, a major incentive for the Fed to keep rates low. Yellen appears to be aware of at least some of these forces as she recently testified that headwinds to the economy may well persist even as the Fed raises rates. To make a long story short, yes, nominal rates may be rising. But don’t count on real rates moving up, let alone into positive territory, anytime soon. Indeed, I fear inflation may be picking up much faster than interest rates. In that environment, Draghi’s predictions of rates becoming more negative over time will very much apply to the greenback as well. And before people lash out at me for downplaying the challenges in Europe, don’t read me wrong: I very much agree that Europe is a mess; it has always been a mess and is likely going to remain a mess. But that’s not the question I’m addressing here. All I’m arguing is that real interest rates in the Eurozone are likely to remain higher than in the U.S. It shouldn’t come as a surprise that we like gold in this environment: a) because real interest rates are negative; and b) because we expect real interest rates to remain negative for a long time. In fact, if you look at how incentives are aligned, they point towards inflation, as both the U.S. government and consumers – given their high debt loads – might want inflation to debase the value of their debt. It’s foreigners holding U.S. debt that suffer the most from U.S. inflation as they have an interest in preserving the purchasing power of the debt. As foreigners are not voting, it speaks volumes about the path of least resistance – or at least the path of greatest temptation.